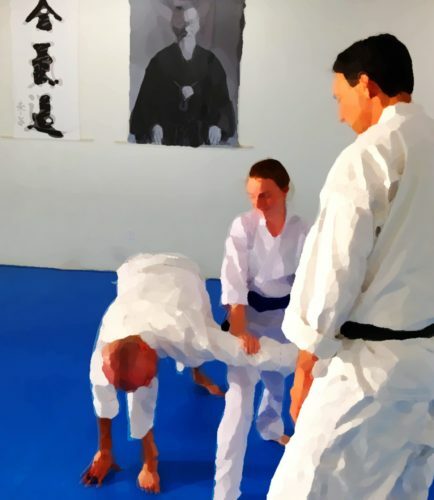 This is the first in a series of posts about Aikido that will continue right through the month of April – twenty-six posts, one for each letter of the alphabet. Most posts will be more concise; this introductory post won’t be typical. This series is meant to be an introduction to the art, and an exploration of some of the ideas that surround it. My intent is that anyone with even a casual curiosity will enjoy and benefit from these posts. Serious students are likely to find something of interest, too, of course! What is Aikido [eye-KEE-doh]? This basic question seems like the most appropriate place to begin. Aikido is a unique Japanese martial art. Instead of fighting, resisting, or blocking an attacker’s energy, we join with the attack and redirect it, often sending our attacker into a harmless fall or roll, or restraining them safely on the ground with a joint lock or pin. Aikido can be soft and flowing, or sharp and decisive. No matter the style, it is not an aggressive art. Fighting is never the goal of Aikido. The result of training in this non-oppositional way is not only that we learn how to handle a physical attack, but we also come to see how we are in relation to others, and we learn how to handle conflict in other life situations. Aikido people around the world are involved in conflict resolution, non-violent communication, and peacemaking efforts. In Aikido we train with our partners, not against them. We train in a dojo [DOH-joe], or school, on firm mats. We practice together in pairs. One partner, uke [OOH-kay], acts as the attacker. The other, nage [NAH-gay] does the technique. Both partners, uke and nage, contribute to the successful outcome of the technique, uke by providing a meaningful, committed attack, and nage by responding to the attack with one of hundreds of possible techniques. Aikido is meant to unite humanity. Aikido was founded in about the 1940s by Morihei Ueshiba, often referred to as O Sensei, or Great Teacher. O Sensei combined his extensive experience in traditional arts with spiritual beliefs that humanity could be united and live in harmony. O Sensei died in 1969, but he taught many students. A few who trained with him for years are still with us, and are still passing his teachings on to their own students. “Aiki is not a technique to fight with or defeat an enemy. We practice working harmoniously with others, and with circumstances. The name Ai-Ki-Do means roughly “way or path of harmonizing or joining with universal energy.” People often refer to Aikido as “The Art of Harmony.” In our training we learn to be direct and clear, focused and relaxed, present and responsive to what’s actually happening in the moment, rather than reacting to our ideas about it, adding tension and fear to an already dangerous situation. One goal of Aikido is to protect the attacker, too. This may sound ludicrous at first. If someone attacks you, why on earth would you try to protect them? Beat them to a pulp! They deserve it! But… What if it is someone who has lost control? What if it’s your friend being combative while having a bad reaction to a new medication? An elderly relative who has forgotten who you are and is coming at you with a frying pan? In the broader picture, anyone who is initiating an attack has lost control. While we have the ability to seriously injure a determined attacker if that’s the only thing that will stop them, we train so that we also have the ability to choose not to. Things seem pretty bad right now. The news presents us with terrible stories daily. Contentious talk shows and horrifying crime dramas, both of which feature the worst of humanity, have been airing successfully for decades. Much of the government is bought and paid for. The high cost of health care robs some of their future, ability to work, or even life. Education expenses chain students to decades of debt, and a degree doesn’t guarantee even an entry-level position. Jobs are shipped overseas, or cheaper workers are imported. Many people have given up on the vision of enjoying even a modest retirement. Foreclosed homes sit vacant while the homeless camp along sidewalks and under bridges. The poor are vilified. Politicians try to divide us, rile us up, and encourage us to blame each other for the situations we are in, while working to dismantle protections for workers, the environment, and the less fortunate. We cannot trust even our national or local government to be on our side. Incivility abounds, and contentiousness seems to be ratcheting up instead of deescalating. Yes, there are also some great things going on now. There’s reason for hope and optimism. We have better access to information than ever before. New scientific breakthroughs are announced almost every day. People have an unprecedented ability to connect around the world. But we can’t overlook how bad some things are at the moment. People feel powerless and angry. In recent decades, something in our culture has shifted. We used to default to optimism and hope. We thought if we were honest, worked hard, and treated people fairly, things would turn out OK.
Now we are at a point where ordinary people – people who have been going about their ordinary business, attending school, working, raising kids, doing the laundry or raking the yard – are looking out at what’s happening around them and starting to notice that something has gone very wrong. Positive, inclusive values are dismissed as “political correctness.” In some ways, we have become mean-spirited, with a rabid appetite for violence. Fighting, bullying, rude behavior, and fearful, hateful attitudes are common, celebrated as somehow being more “real.” It’s enough to make you want to hit something. Fighting seems to make a lot of sense. From the perspective that we are in constant danger, that no one is looking out for us, and that others are trying to take advantage of us, it makes some sense to learn to fight, to be tough, to beat others, and to win. It’s a way to regain some feeling of being safe and in control. But in reality, that approach is like a child taking a stick from the yard with them to bed for protection. With their trusty stick they imagine they will rescue their parents from the rubble after an earthquake, fend off intruders intent on robbing the family, and scare away the monster that’s lurking in the closet. Their stick lets them feel safe and powerful, but in reality it won’t do much good, and might get them hurt. Like keeping a stick at hand, becoming better fighters, being more aggressive, and using force more efficiently doesn’t help us. It keeps us locked in a dysfunctional system. We become stronger, shinier cogs in a fundamentally broken machine. Aikido is a better alternative. The skills we practice in Aikido, on the mat, help us learn to work with others when we are in conflict. We learn to settle down and listen, to see from another’s perspective, to feel what’s going on inside ourselves. We learn to perceive situations more clearly, less influenced by our thoughts or expectations, and to respond fluidly. We learn that we can care for others without sacrificing ourselves, and we learn that when we take a fall, we can pop back to our feet, still engaged with our partner. We learn to be trustworthy, and to trust, to work together for a good outcome. We also learn to laugh and play together, and support each other along the way. We learn that we succeed together, teachers and students alike. Indeed, we learn that even when attacked there is no enemy. We are not separate. These things translate into who we are off the mat. Aikido makes us happier, more compassionate, more effective people, which in turn makes this a better world. Just as a few violent people can affect the life of a whole community for the worse, even a few enlivened, awake people living in harmony brings positive transformation to the culture as a whole. Aikido is a path—a way to physically practice being in harmony and developing the inner qualities and outer behaviors necessary to move forward together. It is a good idea for these bad times. I hope you will come along as we explore some fundamental aspects of Aikido throughout the month, with topics from A to Z. Subscribe to the RSS feed, or find all the posts by clicking the tag #A-to-Z April 2016. If you are interested in training, you can find an Aikido dojo in your area on AikiWeb. If you are in the San Diego area, come visit! I train with Dave Goldberg Sensei at Aikido of San Diego.